Original Bean’s first new 100% bar. This an intense 100% dark chocolate with a very pleasant and perfectly smooth melt. Original beans describes its 100% as a ‘mighty dark cacao’. We’re inclined to agree. Don’t be put off by this description however – the smooth chocolate has layers of delicate flavour. Once the first wave of rich cacao washes over your tongue, you will discover a silky chocolate with a floral sweetness. The aromatic notes build to reveal an almost perfumed profile, reminiscent of rose petals with a cut grass sweetness. 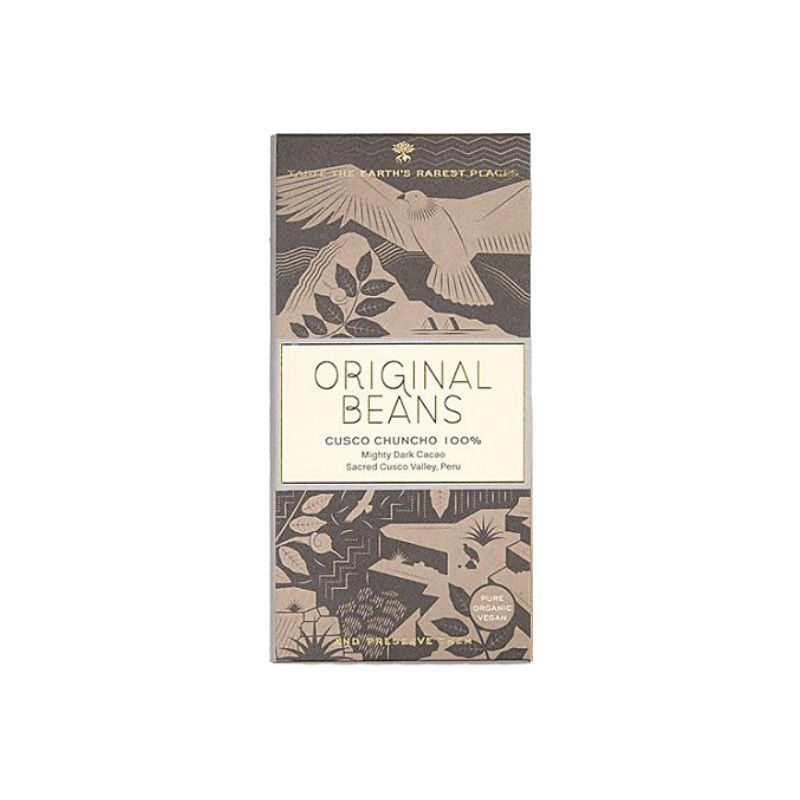 Original Beans has sourced the beans for this dark chocolate from the Cusco Valley in the Peruvian Andes. Also known as the ‘Sacred Valley’ it is a stone’s throw from the Inca capital of Cusco and the ancient city of Machu Picchu. The Sacred Valley is home to one of Peru’s rarest cacao varietals, ‘Chuncho’. Although many modern hybrids also use this name, Original Beans has gone back to the source, to find and preserve the purest strain of this ancient and precious cocoa bean. And it is from this Chuncho bean that Original Beans has crafted this bar. WONDERFUL!! A lovely bar, just the right thickness, nice and 'clean', sharp 'snap' to release a piece (!). The chocolate itself is just adorable...light, not at all bitter ('real' chocolate taste)..caramel-smoothness and just a hint of white frisky wine! Highly recommend PLUS I LOVE this company's ethical stance....no guilt at all...EACH BAR YOU BUY PLANTS A TREE IN THE TROPICAL RAIN FOREST!! wow.. Do support Original Beans and 'save the planet'. Enjoy.